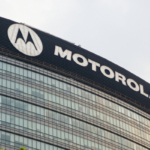 Highland Wireless: Providing In-Building Distributed Antenna Systems (DAS) > Blog > Blog > What is a Transmitter Station? Here at Highland we use repeaters, or transmitter stations, to send out radio signals on two-ways. This is how our Wide Area Network functions. These stations receive and send radio waves, and can increase the distance that these waves are sent by many miles. Hundreds of miles in most cases. 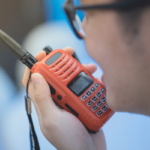 Whereas family radios can mostly only travel short distances, a two-way that works with a repeater can send and receive messages from many miles away, making communication on different work sites quick and clear. Transmitter stations are large spires or masts that can be constructed by themselves or on top of tall buildings. 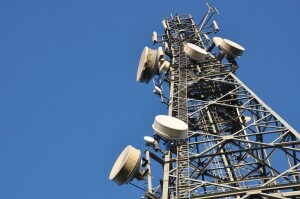 They are used to transmit radio waves for cell phones, two-ways, AM/FM radio, and microwaves. Their locations are selected based on a number of things. Line of sight and power are always considered. In regards to electro-magnetic radiation, line of sight refers to waves traveling in a straight line. These waves, without obstructions, can typically travel from the origin, to the horizon, but not past it. In many instances, waves do not travel to the horizon due to objects such as hills, buildings, trees or even the atmosphere. These obstructions can bend, reflect or absorb the waves and render them useless past the point of the obstruction. By raising stations and masts, the line of sight of waves are increased, making the waves receivable for longer distances. Most stations are high above the ground to meet line of sight criteria. Many towers or masts are also set far away from inhabited places depending on government regulations. To give you an example, picture two people standing on opposites sides of a hill. They each have a two-way radio, but cannot talk to one another because the hill is obstructing the waves being transmitted from and to each radio. Now imagine a large tower standing on the top of the hill, with a large antenna sitting on top of it. Now, when one of the people sends a message to the other, the radio wave first goes to the station, and is sent back out to the other two-way. This happens both ways, and makes it possible for the two people to communicate even though there is a large obstruction between them. The tower sitting on top of the hill also increases the line of sight of the antenna as compared to an antenna that is sitting at ground level. In addition, masts are located in city versus rural areas based on their power. Higher powered stations are typically in rural areas, whereas lower powered stations are in cities, where radio waves do not need to travel as far. High powered stations are also mainly set up very high, so that their signal can be reached many miles away. TV and FM stations are typically built on top of hills as well. Often the stations have more than one antenna, but depending on how many stations are being transmitted, multiple antenna can be used. By using a diplexer that splits the signals, one antenna can be used for many transmitters. AM radio transmitters are high-powered and low-frequency, and because of this are often set lower to the ground. The lower frequency waves travel as ground waves, which allows them to be received well past the point of horizon for that particular antenna. AM stations can transmit long, medium and short waves and are assigned to frequencies for long distance communication. At each station, an antenna is what is doing all the work; sending and receiving radio signals. Each station is usually nothing more than a base for the antenna. Sometimes there is only one antenna, other times there are many. The mast can be a supporting structure for each antenna, or the antenna itself. Each station uses electricity to send and receive transmissions. They often also have back-up generators in case of power failures. In rural or remote areas, these stations are often not manned. Operations can be controlled from off-base computers and any problems that arise have to be dealt with when personnel can get to it. In more populated areas, some stations have full time crew, others part-time. In most cases someone is available at most hours to resolve any issues that come up. 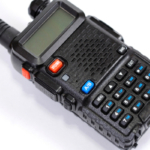 For many two-way radio users, simply having two radios to receive and transmit signals is suitable. 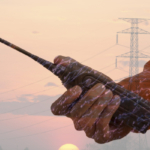 If you are a crew working together on a small job site, or just a couple of friends hunting in the woods, a transmitter station is not necessary. In contrast, a project manager who is responsible for many job sites that are separated by many miles reap the benefits of area wide stations (read more). Their messages are sent and received in approximately the same time as simple two-way radios, but can cover vast distances. Communication between sender and receiver is instant and clear, even when there are large obstructions and miles between them.